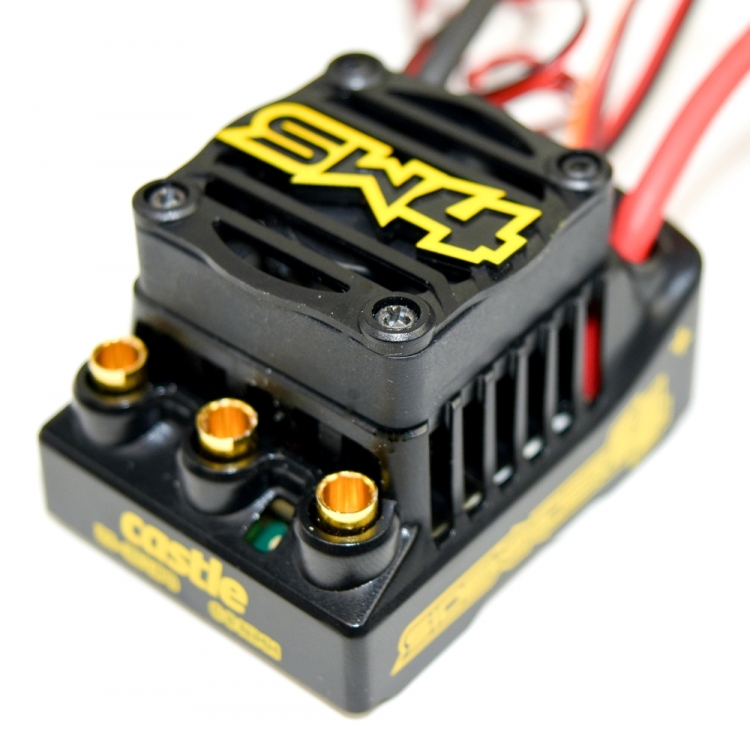 While the all new SIDEWINDER 4™ builds upon Castle’s most popular platform, the SIDEWINDER 1/10 SCALE SERIES, it is the first of its kind to run Castle’s newest technology, CRYO-DRIVE™. CRYO-DRIVE™ combines technology from cutting-edge hardware and software advancements to increase thermal performance. COOLER TEMPS mean LONGER RUNS and MORE POWER in your SIDEWINDER 4 setup. 2s - 3s LiPo; 6 - 8 cell NiMH use in vehicles up 6.5lbs with battery, ready-to-run. Sensorless brushless and/or brushed motor operation. 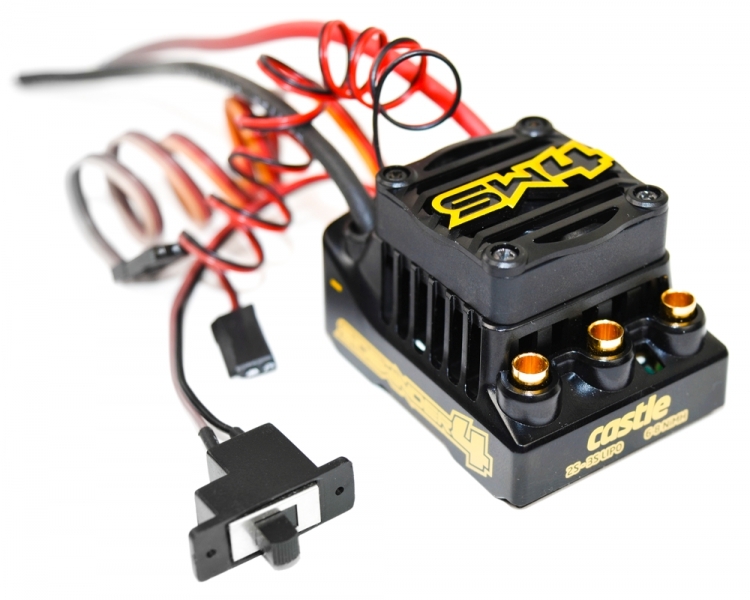 The SIDEWINDER 4 is a versatile ESC and is accepted in a wide variety of applications. Whether throwing dirt, ripping through a corner or steadily dominating the trails, we’ve got you covered! ESC only for rock crawling applications with brushed** motor down to 19 turn. Cryo-Drive technology is the result of Castle Creations' software and electrical engineers putting their heads together to improve the thermal performance of the well-known Sidewinder 3 electronic speed control. Castle has developed new software that minimizes the amount of time the ESC's electrical components spend generating heat by optimally controlling which components are being used while driving the motor. This is happening thousands of times per second, which greatly reduces the rate at which the Sidewinder 4 heats up. Overall, the Sidewinder 4 generates heat much slower than previous versions. This software breakthrough has been coupled with a completely re-designed case. A great deal of time was spent studying fluid dynamics simulations in order to optimize the airflow through the case. Improving the airflow into and out of the case, allows the cooling fan to become more effective. In order to take full advantage of the improved airflow efficiencies, a 44% larger, higher flowrate 30mm fan was selected. The improved case coupled with the 30mm fan significantly increases the Sidewinder 4's ability to remove heat from critical components, such as MOSFETs and capacitors. By reducing the rate at which the Sidewinder 4 heats up and removing heat more efficiently, Cryo-Drive takes thermal performance to a whole new level. The Sidewinder 4 allows users to push beyond the limits of previous generation Sidewinders by handling higher gear ratios in heavier vehicles with longer runs. **Brushed motors are recommended for rock crawlers (vehicles traveling 3-5mph.) 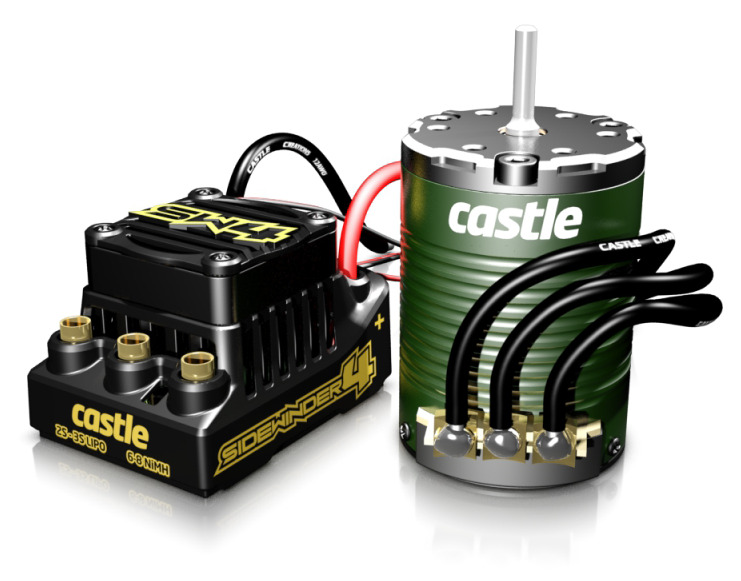 Brushless motors are fine for use with rock racing. If your vehicle is going to be in a bound up situation, very slowly traversing rocks and obstacles, you are running a rock crawler. If you are constantly traveling at 5mph or higher, you have a rock racer. With the optional Castle Link USB Programming Kit you can use your Windows™ PC to easily program your controller. Ability to save setup profiles for later use. Cooling Fan: Optional- Coming Soon! 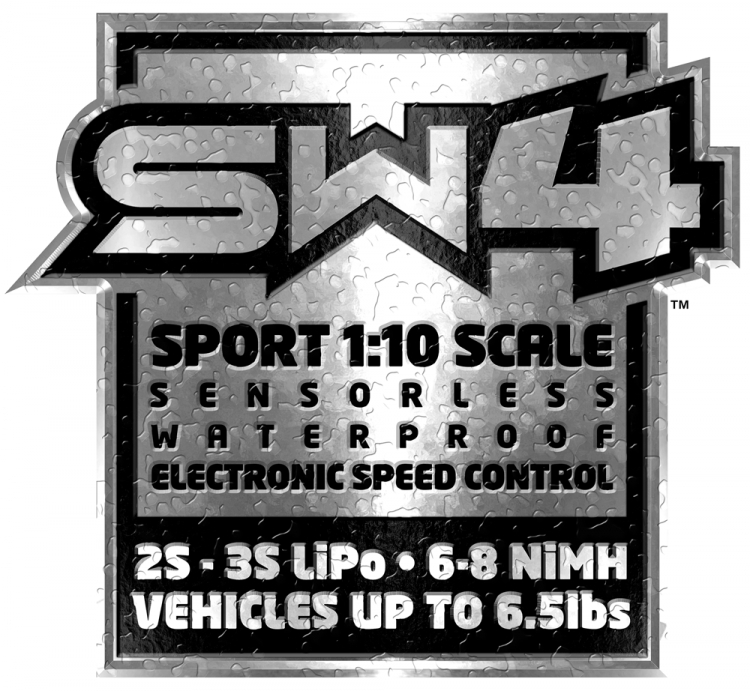 Application Guidelines: For 2WD short course trucks on 2s LiPo and geared conservatively. Please refer to our Gearing Chart for recommended motor, battery and gearing for some of the more popular vehicles on the market. Monitor motor temperatures closely; overheating a motor will cause permanent damage to the magnets. Never exceed 180° F on the the motor or ESC. Water Resistant Design: Routine maintenance is recommended after running in wet conditions. Please refer to this document for running and maintaining motors in wet environments.